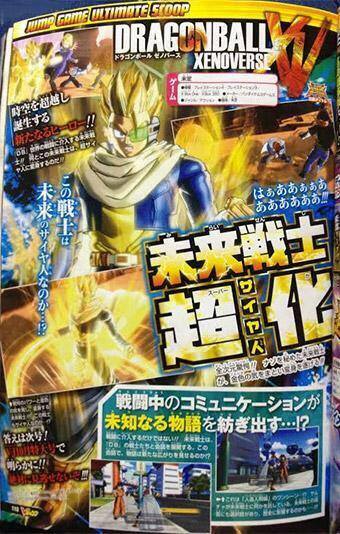 The latest V-Jump was leaked today showing off the Future Warrior’s Super Saiyan form. The first left scan seems to give more hints at having multiple people fight on the screen like Battle of Z.
We’ll translate the scan as soon as we have it in better quality this Tuesday. I wish Wii U could get Naruto and DBZ games as well. But Tomy lost their rights to make anymore Naruto games. Not sure how Xenoverse would work on the Wii U.
I wish this game was on the PC, damn, it’d be awesome with mods and such. Well they said that they would try, and I heard the demo at japan expo was played off a PC, even though they used pa3 controllers (is that normal, sorry don’t know much about pc gaming). Well, if Tomy lost their rights to Naruto, I don’t see why Namco can’t just release an Ultimate Ninja game to the Wii U. And Xenoverse is coming to the Xbox 360 and PS3, right? The Wii U is more than capable of handling it. All they have to do is remove the trophies/achievements and allow the Wii U gamepage to emulate it on a second screen. Nice. I picked one up last month and I’ve been having a lot of fun with it. I’m definitely looking forward to Smash Bros and Hyrule Warriors this year. They said that they were interested but had nothing for the console yet, I guess they wanted to focus on the next gen and making it good as possible so they can keep the license (as well as still have people buy and look forward to their db games) and didn’t know how it would sell in the wii u.
It’d work on the Wii U the exact same way it’d work on the rest. Why is everyone so ignorant to the fact that the Wii U has a real controller besides the gamepad? Seems like the Story or Universe Mode lets you travel around the City and possibly the DBZ Universe.. Maybe. When this will be translated? When we get our copy. We always translate the scans. Just not when it’s in low quality like this. This just murdered all the “He’s Super Saiyan God” garbage rumors some of you nitwits believed. Can’t wait for Tuesday then.